Monday 29th - This morning after a very emotional farewell to Simon and family we set of on our penultimate day’s ride on this epic journey that we have been on for the last two and a half Months. 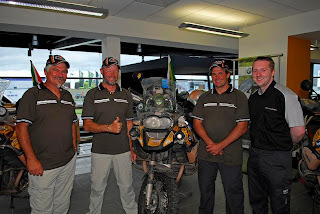 It seems so long ago now that we set off from Durban Auto Umshlanga on the 25th April. We have seen and experienced so much along the way. Met a lot of people, some wanting to shoot us with AK’S, some throwing stones and sticks, but the majority of the people we have met have been really fantastic. We have shared a lot of these experiences with all of you and that is why it is with mixed emotions that we head off to Dublin. Joy that at last we get closer to our destination and then head back home to our families, friends and loved ones, but this is also tinged with a sense of sadness. This has been an experience of a life time for us, we have met fantastic people along the way, and through the internet medium we have been able to share some of our experiences, highs and lows with you, our friends and supporters along the way. Speaking of which it has been a great pleasure and comfort to us knowing that daily, someone is checking up on our progress and we always knew that there are hundreds of people out there caring and praying for us all along the way. After we left Simon we knew we had the whole day to get to Holyhead where we were going to camp before crossing into Ireland tomorrow. We set my GPS to take us on a scenic route up through the Brecon region of Wales and then from there follow the valleys up to Anglesey. When we got into the Brecon area the road went straight through a military training area. Now I had heard of the Brecon area from guys that used to be out here in the army, this is also the area that SAS do their selection. As we entered the area I was keeping my eyes opened to see if I would see some poor new recruit being chased over the hills by some Corporal. Half way through the area we stopped to take some photos of the rolling hills and spectacular scenery. We had just got our cameras out and taken a few shots when we heard mortar fire coming from just over the hills from us. After our experiences in Sudan with their Military we looked at each other and said Oh S*@# !!! Here we go again, except the British Army is using maximum force against us. Packing our things away with much haste we got on our bikes and headed out of there. As we rounded a hill we saw to our relief the source of the mortar fire. No it was not intended for us. The troops were doing a training exercise in the area, as we went by they cheerfully waved us on. Phew!!! 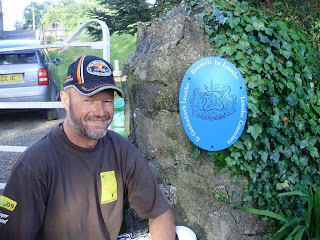 During the day we received a phone call from Simon to inform us that he had found a place for us to sleep in Holy head. Nothing less than the house of the Lesotho Consulate to the UK. I at first thought that Simon was pulling our leg. But when he gave me a number to call we believed him. Who would ever believe there was a Lesotho Consulate based on the small Island of Anglesey? How many thousands of Km’s from South Africa! This we had to do, putting a call through to Carl Clowes he confirmed that yes he was the Consular to Lesotho and he was expecting our call, and yes we were very welcome to camp in their front yard. With no further ado we were off and arrived at their house at about 18h00. Arriving there Dorethy, Carl’s wife showed us where we could put up our tents and invited us to join them for dinner, which would be served at 20h00. Over dinner we spent a very pleasant evening talking to them about the projects that they are involved in, in Lesotho, and we told those tales of our adventure. Now up until now we had crossed 17 countries. I have now added the 18th!!! The Consulate is classified as sovereign territory of Lesotho that then makes the garden bona fide Lesotho country. 30th July - Up early this morning and getting our tents packed. We were relieved to see the sun shining. This meant we would be riding into Dublin Ireland under a clear sky. 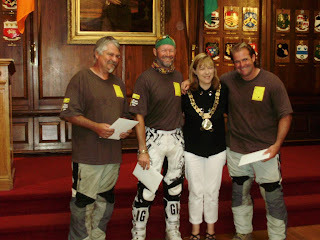 We really did not want to arrive at the Mayors Mansion sopping wet and wearing rain suits. We boarded the Stenna lines Ferry that transported us from Holy head and with a scence of excitement we traveled across the Irish Sea and into Dan Loughie harbour. Waiting there was Tom Kerrigan (A very enthusiastic member of the Dublin BMW club) Tom had been instrumental in setting up our meeting with the Lord Mayor. With Tom was Dennis. We nick named him Curb, and Dave Humphreys, Dave is from Joe Duffy BMW, where we were due to attend a end of ride party that evening. 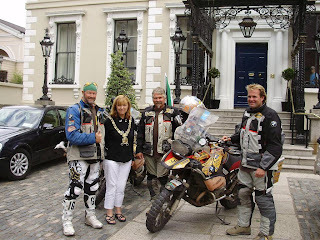 With Dave leading the way we set off through the city of Dublin with the South African flag flying very high. Not only had we arrived, but as every rugby fan knows we had just beaten the Lions in SA. The Mayor was waiting for us at the Mansion, and during tea we handed over the Letter of greeting from The Mayor of Durban, The Honorable Obed Mlaba, that had been carried all the way from SA for the Mayor of Dublin. When we were still in SA on our way to the Swazi border we had stopped at Shakaland where I had bought a Zulu spear. This has also traveled strapped to my bike for the whole trip. This Spear I also handed to the Mayor as a token of friendship. We could not stay to long at the Mayors office as the Mayor had another appointment to attend to plus we were due to meet up with the South African Ambassador at the SA Embassy. We arrived at the Embassy and we were warmly welcomed by the Ambassador and her assistants. We were invited into the conference room, and there waiting for u was a table laid out with snacks and good old South African red wine. We looked at each other knowing that we still had to ride out to the BMW dealership some 15km’s away, and we were not sure of the drinking and driving policies in Ireland. I think the Ambassador saw our look of disappointment that we could not have a glass or two of South Africa’s finest. With out batting an eyelid the Ambassador pours three glasses and says that it is not everyday she gets a visit from three tough guy’s that have traveled Africa to get here. She tells us that for the rest of the afternoon we have diplomatic immunity, so enjoy the moment. Mrs. Ambassador you rock!!! We were not going to start abusing any countries hospitality so having only two glasses of said wine we bit our farewells to the good people at the Embassy and following Tom, Dave and Dennis we set of once again through the city for the BMW dealership. This is where Dennis earned his nickname (Curb) as we were going along filtering through the traffic. Dennis decides to overtake a car on the left. What he did not see was that there was a small curb of about twenty centimeters in height. 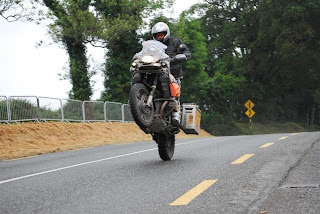 Anyone that has done a BMW off road course will have learned that a GS 1200 ADV cannot climb a curb. Well how he stayed on we that were traveling behind him still do not know! With lots of wobbling around and legs flying he managed to bring the bike back under control, Dennis says he was watching the car next to him and did not see the curb, we think maybe two glasses of wine may have been the cause. I also think the only reason he did not fall was the thought of a very hefty repair bill to his new bike was motivation enough to make sure he stayed with the bike, come what may. Arriving at Joe Duffy BMW we put our bikes up in the show room where they were on display for the evening and the next day. We headed back to the hotel to freshen up and change into casual clothes, then it was back to the dealership for a cocktail party and meet the Joe Duffy customers and give a talk on our trip. 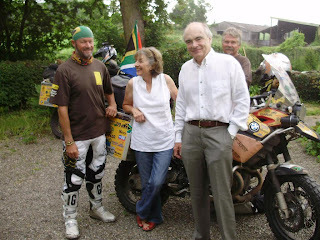 Jaco’s father also read a verse from the Bikers bible that I had carried with us from SA. 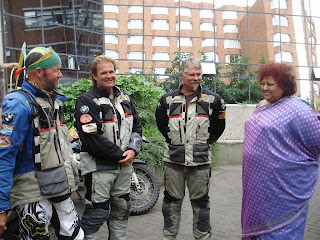 We had started the journey at Auto Umhlanga on the morning of the 25th April with Hein Jonker reading a verse out of the same book, asking for protection and guidance for us during the trip. I thought it only fitting that we end the journey with a word of thanks. 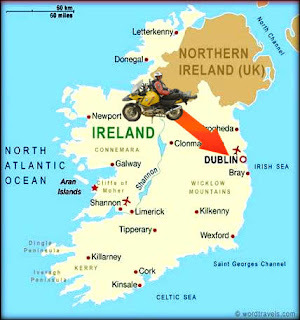 2nd July - Tom had arranged for us to get out on our bikes and take a ride up into the hills of Ireland. Tom was due to be back at work so Aiden Lynam a journalist and photographer offered to take us around. Looking out the window we were greeted by a typical Irish day, pouring rain. 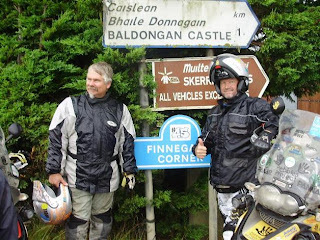 We had just ridden 18000km’s through some fairly rough territories, a rainy day was not going to put us off a days ride. Meeting Aiden at Joe Duffy’s we were introduced to Peter ( The Greek ) who was going to be joining us for the day. Looking at the sky and the heavy clouds we decided not ride up into the mountains. With all the rain and mist we would not see anything anyway. Aiden told us about a road race that was taking place on Saturday in a village called Skerries, so we decided to take a ride out there and have a look around the track and area. Skerries race meeting is a motorcycle road race based on the same principles as the Isle of Man TT race. In other words the bike riders race around these country lanes at speeds reaching up to 120 mph. Convert that to km’s and you can believe it is FAST!!!! Very fast. And then on top of this there is no kitty litter or catch fences if you crash. If a rider does crash he or she will most likely end up hitting a tree, ditch or farm brick wall. When we arrived at the track we met with Ray the club secretary. Ray gave us permission to have a ride around the circuit and take a few pics. Ray also invited us to be their guest on Saturday (Race day) and have our bikes on display in the paddock area. Riding around the circuit at a much slower speed than what the racers would be doing on Saturday, I was really impressed that anyone could be brave enough to take part in a race of this nature. How there are not a lot more injuries and deaths in this type of Road Racing I do not know, shows the quality of riders that enter. There is one section of the circuit where there’s a slight rise in the road. This is a popular spot for photo shoots, because the race bikes normally end up with the front wheel slightly off the ground in a kind of wheelie and makes for good pictures. The bikes normally come over this rise at 120 MPH. Aiden showed me a few photos that he had taken at that spot, and casually asking if I would like him to take a photo of us riding gently over the same spot on our big heavy ADV bikes with panniers on. Is a duck waterproof, of course we would like that. Off I go to do a circuit of the track at a sedate pace and when reaching the spot where all these race bikes get air born at 120MPH. I am traveling at 120 km’s per hour. Beeping my hooter to warn Aiden that I am approaching, this was prearranged. I ride over this slight rise in the road. I now let the photo speak for itself. Not much you can’t do with a 340 kg BMW Adv with panniers. Poor Aiden did however get a big fright just after this pic was taken, when my front wheel came down the right pannier. (The same one that got beaten up during my fall in Italy) came off the mounting and went skidding off down the tar road. The noise of this sounded just like a bike crashing and sliding on tar. Poor Aiden thought I had bought it. Once again our Metal Mule panniers have shown their worth and strength. I turned around went and picked up the pannier, besides a few extra war wounds and scratches the pannier was still intact and closed. Putting it back on the rack we were once again on our way. After a fantastic even though it was wet, day’s riding we said our goodbyes to Aiden and The Greek, and headed back to the hotel for a much needed hot shower and dinner. 4th July - Yes I know I have skipped the 3rd. Yesterday was a very quite day, spent loafing around Dublin, so not much to talk about now, besides I need to keep something back for the book, Otherwise you won’t read it, old news. 5th July - Jaco today headed off alone for London, He is going to see his best friend based there who he has not seen for a few years. Howard and I went out to Skerries Race to spend the day watching these very talented riders race around the circuit that we had just the other day at a snails pace, compared to these blokes. Unfortunately today was again a very cold and rainy day so the racing was not as quick as they normally are, still fast mind you, but no lap records were broken today. What was a treat to see was the site of Jim Redman dressed in his trademark black leathers riding his Classic race bike around the circuit. At 76 years old he still got around the track faster than we did the other day. For those of you who doesn’t know who Jim Redman is, he is a South African who when he was much younger was 6 times world motorcycle GP champion, and multiple Isle of Man TT winner. At 76 still riding and still alive, is a great feat. Tomorrow Howard and I will be leaving Dublin, Our mission accomplished and the adventure over. We head now for Antwerp Belgium to crate our bikes to get them home, we then fly out of Munich Germany. This journey has been an adventure of discovery for all three of us, it is with a very heavy heart we are saying good bye to our travels, who knows what lies ahead. ridden at an overall average of 65km’s per hour. Used aprox 1450 liters of fuel each, used two sets of tires each and replaced two rear shocks. For every one that has supported us, comments on the Blog, Sms’s, prayers, Phone calls or simply in your thoughts, We all three thank each and every one of you for being with us every step of the way. I can tell you that without the knowledge that there were all you fantastic folk following our journey and urging us on there would have been times where it would have been so easy to give up. To all our families back home I thank you as well and look forward to getting home to tell you all in person about this trip. Jo, A very big thank you for giving Howard the freedom and time to come along on this ( What he still thinks was a joke so many years ago in Mozambique when I first talked about Durban To Dublin ) I know how hard it has been for you. Corne, Barent and Berne, Thank you to. Jaco I know, and saw how much he missed you. Being on the farm without him there I am sure was very hard for you guy’s. Jaco’s Mum and Dad, “Dankie dat julle Jaco die kans gegee het om hierdie trip te kon onderneem”, you asked (No told me) to get him here safely and home to you. I have done what you asked, He is here safe and in one piece. All I now have to do is get him back to you then I have fulfilled my promise to you. Mum and Dad Scheffer, I know you do not have internet, but have been following by means of the print outs Liz has been bringing to you. I hope you have enjoyed following our adventure, and thank you for your prayers and thoughts. Last but not least we all say a very big thank you to each and every one that supported us by means of sponsorship, by your generous support we not only had an adventure of a lifetime but we were able to raise some considerable amount of money for our chosen Charity. PEBBLES. And who knows there may be another adventure that needs to be experienced……. The first I knew of your exploits was seeing two of your bikes in Vauxhall, London, and riding with you through Battersea to Wandsworth. My girlfriend and I were on blue and grey Piaggio X9 500s. Jackie and I are both very impressed with what you have done, and hope you enjoy a safe and well earned trip back home. Hi Roger!! !Nearly over hey! !We are all bursting with pride!! Yip,we are still waiting on the Mayor of Durban for an invitation to his 'do'...I am sure it will happen, but probably not till much later in Aug....I have been told by his functions organiser that we must just wait now, till the mayor grants him an 'audience', so a date can be arranged. het is nu maandagavond 9 uur en wij (Dirk & Denise) zitten hier thuis in de zon op ons terras. Jullie zijn waarschijnlijk al terug in Zuid-Afrika dus het "gevaarlijkste" deel(München-ZA)van de reis is achter de rug. Het was een korte maar aangename kennismaking en we hopen jullie ooit eens terug te zien in België, Frankrijk of Spanje. Morgen, dinsdag, zullen we de motorfietsen laten bezorgen in de haven van Antwerpen en dan is het tijd voor een gondige poetsbeurt! Howsit Roger, Howard & Jaco! Hey, well done you guys! You can now come home and put your feet up and know that you have achieved what the rest of us bike riders can only dream of! I admire you tenacity and spirit that has come through loud and clear in your blog. Having been through what you have and be so completely positive at all times underscores your "houding". Your blog has read like an adventure novel in installments. I couldn't wait for the next "gripping episode". Welcome home and know this - you now have a lot of work to do - roadshows, talks and "tell alls". Once again congratulations on a fantastic epic journey. The main thing being that you get home safely to your families.